Today looked really well with CAPE-values of 6.000. 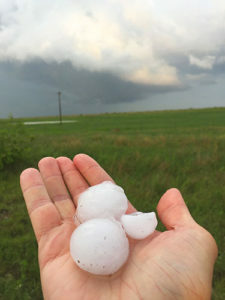 The problem was that there were three targets to choose from: Big Spring, TX (where I saw a landspout tornado in 2014), Woodward, OK and Donley, TX. We chose Donley since there was a big flood risk in Big Spring and Woodward did not look as good as Donley. There was an apparent target already at 3 p.m. coming up along with a tornado watch in our area. We watched it for a while at a distance before we headed out there. We arrived at a beautiful immature LP-cell in the perfect environment. For the first time on this tour we could observe it without rain and, in all other aspects, perfect environment. 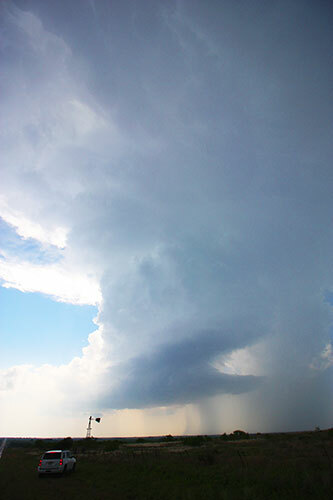 The LP supercell that died off. A neat sun dog feature in the anvil. For some reason, it started dying off more and more and completely evaporated after a while. There were no other good options really in the area so we sat and waited to see where we should go. It felt like the day was over. After about an hour a second wave punched through and pushed up a new set of storms a bit further west. It did not look all too impressive at first but generated, lowered to the ground and started to look really impressive. For some 20 minutes it formed a wall cloud and apparently spun up a brief tornado (that we did not see). When the sun was about to set it was the absolutely perfect setting for a photogenic tornado. 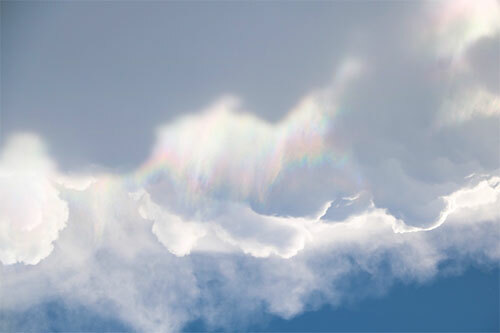 We had the sun in our back, we could see the entire storm structure and there was a rainbow to our left. Instead the RFD undercut the storm and you could start feeling the wind in your face (coming out from the storm, instead of going in) which was a sure sign it was dying off. It did so in a spectacular manner though. 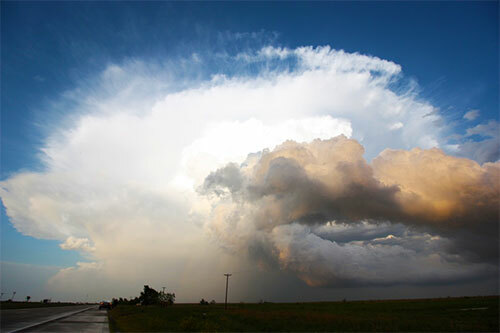 A beautiful dying storm near Jericho, TX. We finished off at Big Verne’s steakhouse in Shamrock, TX, where I realized I had dinner before (after the Canadian, TX, tornadoes). It always feels funny when you realize you arrive at a place you have already been to in Tornado Alley. Arriving at Elk City, OK, I saw a familiar car at the parking lot of our hotel. 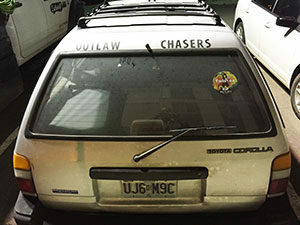 Apparantly, Randy and Lisa from the Outlaw Chasers that I chased with last year, was in the same hotel. I had a quick chat with them before finally crashing in my bed. Chase date: May 23rd 2016.